began in 2013 with a small group of families committed to loving God and loving our neighbors. As residents of the Redland community, the founding families watched our surrounding neighborhood experience explosive growth. The population of our ZIP code (36093) grew 43% from 2000-2010. We love our community for many reasons and others are falling in love with it as well. Rather than leave our community on Sunday to gather for worship miles away, we saw an opportunity to begin a new church family focused on loving and inviting our local neighbors. As we were praying and developing our plans, the number that got our attention the most was the 2010 U.S. Census that revealed 52% of people in Elmore County claim no religious affiliation. That makes Elmore County the 5th least-reached county in Alabama. Rather than try to take people away from other churches, our focus has been for this 52%. Whether they have never known Jesus, or have walked away from church, our heart is for them. First and foremost, we long to grow as people who know and love God. God has extended himself to us by sending his son, Jesus, into our world. To know Jesus is to know God. We seek to grow as followers of Jesus by our worship gathering on Sundays, Bible studies and discipleship groups, and teaching him to our children. We also aim to live in community with one another, encouraging and helping each other along the way. It really feels like a family! Finally, we want to extend the love God has shown us into the lives of those around us. Our church family regularly serves our community and wants to make a difference in our neighborhoods. The Redland Hills Church is a non-denominational church. Our church family is made up of people from many backgrounds, including those who have no religious background. Despite our varied backgrounds, we find it helpful to state what unites us. To read our statement of faith, click here. 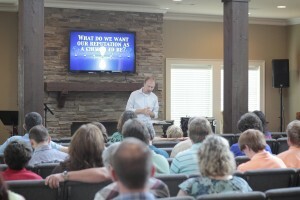 We are an independent church, led by a leadership team from within our family. The best way to learn more about our story and who we are is to participate in our Starting Path classes, which occur approximately every 6 weeks. We share our story in greater depth, communicate the details of our mission, and are happy to answer your questions. We’d love for you to come for a visit and experience what God is doing among us.